Who can resist a little handmade doll with a holiday theme? Make them as gifts or start your own collection. Perfect for sitting on the edge of a shelf or display them on their own bench. Their base is a purchased wood body and head you glue together. Coif them, paint a face on them, then dress them up. They’re so much fun to make. Depending on the clothing you choose, little sewing may be required. The foundation for these dolls are all the same: two wood pieces. The head is round with a flat bottom. The body is a half egg shape with a flattop and bottom. Glue the head onto the body with wood glue matching the flat side of the ball with the narrowest flat side of the egg shape. Once the head is attached, paint it a skin tone if you like with craft paint, or leave it wood tone. Then add facial features. A permanent marker will give you more control for creating the features than a paint brush. The features should be crowded toward the center of the ball and all together, measure no more than 3/4” tall and wide. Create the arms and legs by sewing two long edges of each t-shirt fabric strip together using a 1/2” seam allowance. Also sew the ends shut with a 1/4” allowance. Now cut each strip in two so you have a 4.5” strip for one leg, and a 3” strip for one arm. Do the same with the second strip. Turn the strips inside out. The finished edges will be the hands and feet. Your doll is ready to coif and dress. 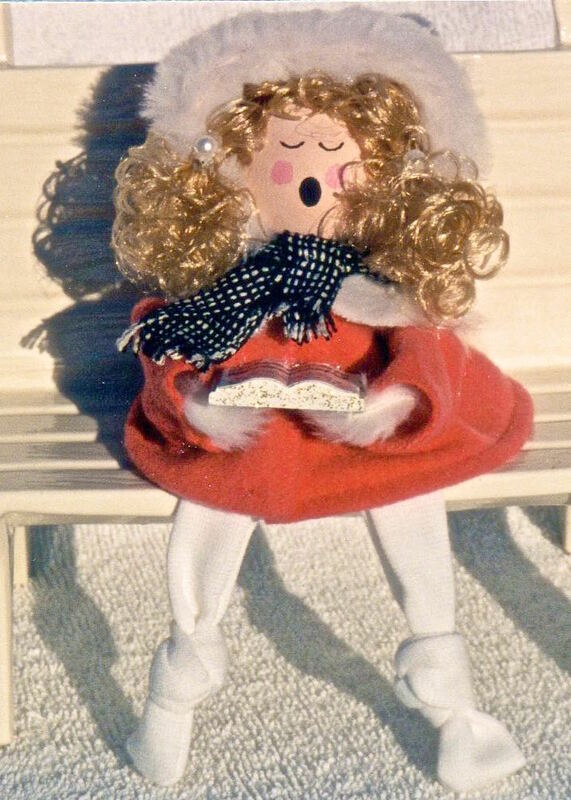 No sewing is required for this Caroler. Two triangular shaped pieces of red felt are glued at the side seams. The top of the coat is glued to the neck area. Tubes of felt are glued at the under arm seam, and used for the coat sleeves. The tops of the sleeves are glued to the side neck area. Small rounds of fake fur are glued to the edge of the sleeve, representing mittens. All the gluing at the neck is then covered up with a piece of fake fur cut into a collar shape. Big clumps of doll hair are glued to the bald head. Then a strip of fake fur which drapes across the head, is glued to the neck area, creating a fur hood. The Caroler ensemble is finished off with a scarf by cutting a thin strip of wool, fraying the edges and tying it around the neck. The mittens are glued to the Christmas Carol Book, an item found in the doll department of craft stores. 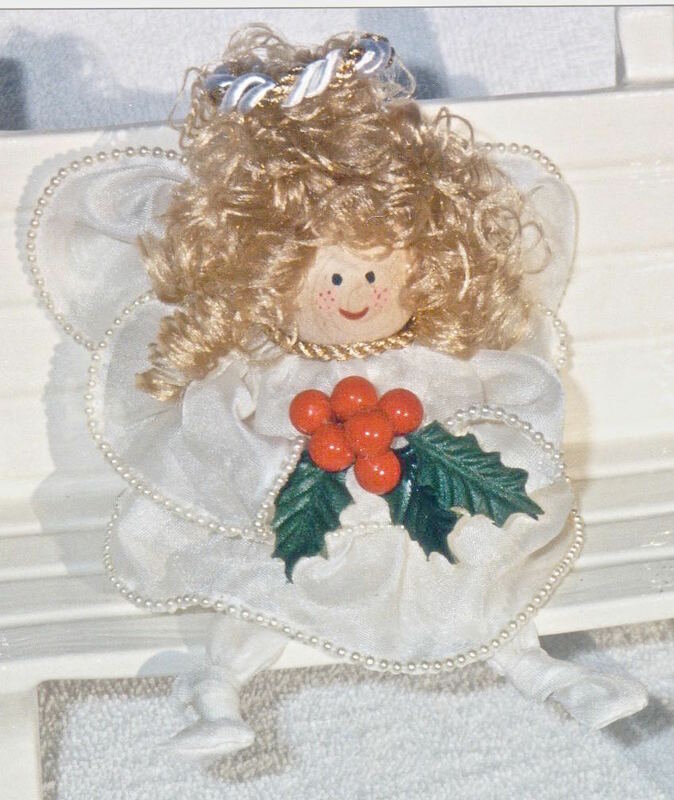 The dress for this angel is made from store bought semi-sheer ruffles with pearls attached to the edge. Wrap and glue a layer at the lower body, then another layer higher up. I sewed together sleeves that were wider at the cuff, then attached the top of the sleep to the side neck. No arms were needed for this doll. The sleeves were curved and a couple of dots of glue were applied to hold them in position. Holly from a silk flower arrangement is glued to the front between the sleeves. For the wings, I took a small length of the ruffled fabric, folded it in half, glued all the raw edges together, then turned the edges inside with two pearl edge sides together. I wrapped a thin ribbon around the center, then glued it to the neck back. The pearls on the edges help keep them curved out to create the wings. A gold fabric cord is glued around the neck to hide the raw edges of the dress fabric. Big clumps of doll hair are glued to the bald head and crowned with gold and white fabric cord. The gold satin fabric used for this doll’s dress has “Happy Hanukkah” lettering all over it. Two triangular shaped pieces are sewn at the side seams, then hemmed and glued to the body at the neck. Tubes sewn together inside out and hemmed, are used for the sleeves. I threaded a pipe cleaner through each arm so that it could be bent and shaped, then glued the arm to the upper inside of the tubes. The tops of the sleeves are glued to the side neck area. A square bib that covers the neck area, is made with two pieces sewn together inside out. They are overlapped and glued together in back and accented by a gold bead in front. A thin gold cord is glued around the neck to hide the raw edges of the dress fabric. Clumps of doll hair are glued to the head and left long enough to cover the back bib seam. The final touch was a song book glued to the hands.